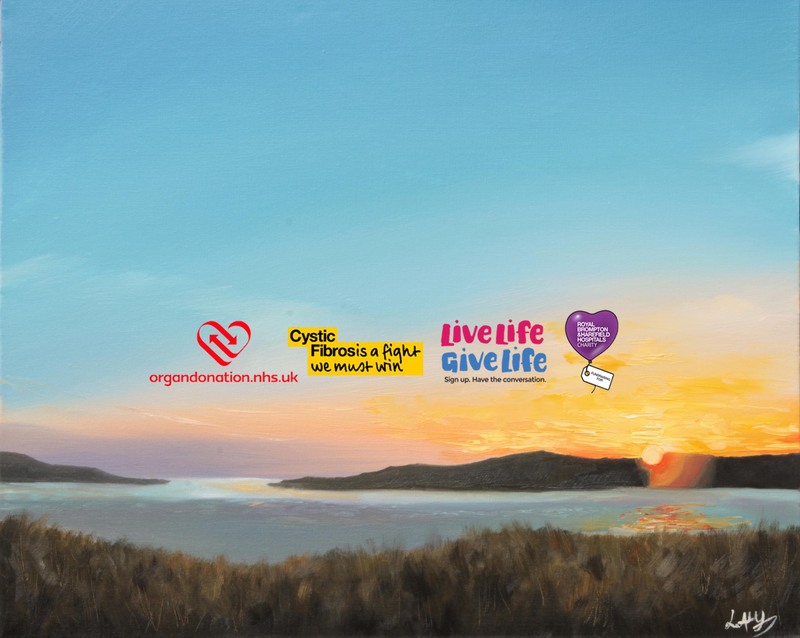 The funds raised from the sale and/or commissioning of works will be donated to charities who work hard to raise organ donation awareness and support those living with Cystic Fibrosis. Here is a summary of who they are and what they do. Most people don’t understand what cystic fibrosis is, or what it does, until someone close to them is affected by it. They soon discover it’s a life-shortening genetic condition – only half live to celebrate their fortieth birthday. Cystic fibrosis directly affects around 10,000 people in the UK. The faulty gene is carried by over two million people in the UK, most of whom have no idea. If two carriers have children, there’s a one in four chance their child will have the condition, which slowly destroys the lungs and digestive system. People with cystic fibrosis often look perfectly healthy. But it’s a lifelong challenge involving a vast daily intake of drugs, time-consuming physiotherapy and isolation from others with the condition. It places a huge burden on those around them and the condition can critically escalate at any moment. We also fund initiatives to improve the welfare of (and outcome for) patients in need or receipt or organ tissue transplants, in addition to supporting the public recognition of donors and their families. We are proud to work closely with other transplant organisations and charities, including NHS Blood and Transplants, the Donor Family Network, Transplant Kids and the Transplant Support Network. The charity supports Royal Brompton and Harefield Hospitals by buying equipment, funding vital research and improving the lives of patients with heart and lung conditions. Although the hospitals receive NHS funding and form an NHS Trust in their own right, the hospitals remain pioneers and world-class centres for the diagnosis, treatment and care of heart and lung patients as a result of the extra funding that the Charity can provide for carefully selected projects. Royal Brompton Hospital’s CF centre is the largest in Europe. It is a world leader in the development of new treatments and has become a model for other units in the UK and Europe, caring for almost 693 adult patients with cystic fibrosis.